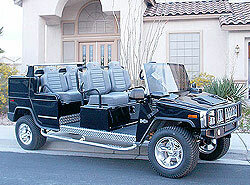 A Hummer Golf Cart Is Truly Remarkable. A Hummer golf cart just might fulfill your craving for a fantastic new toy to flaunt around the country club this summer. The standard model comes with many options found in a full-sized H3 including functional headlights, tail lights, fog lights, a reverse warning buzzer,over-sized side mirrors, working horn and turn signals. This sweet ride is also equipped with an electronic speed controller, front wheel hydraulic disk brakes that are mated with a self adjusting rear drum brake system, an on board computer controlled charging system which allows the car to be driven and charged anywhere a power outlet is located. On the dash is a 12 volt power outlet for any of your electronic devices. 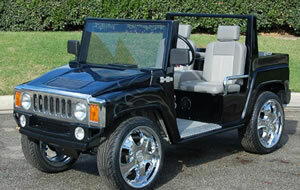 If you want to personalize your Hummer golf car there are tons of available options to choose from. You can go for chrome Hummer wheels in numerous styles and sizes. .....Crank up an in-dash CD or DVD entertainment systems for top of the line sound and video. 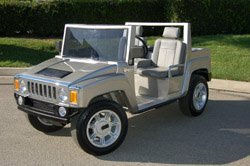 Go for running boards, leather interior, chrome brush guards, custom paint or graphics to make it truly your own unique mini Hummer H3. but only American Custom Golf Cars are officially licensed by GM and provide a certificate of authenticity for every electric golf car they build. Soon enough there will be limos around country clubs, posh resorts and gated communities transporting people to and fro.